While raising baby rabbits, it’s very fun to watch the tiny kits grow in the nestbox, and then turn into delightful fluffballs at three and four weeks of age. Baby rabbits generally stay in the nestbox for the first two weeks of life. The doe takes care of them, and you take care of the doe. See Care of Baby Rabbits for more detail about taking care of your baby rabbits when they’re first born, up to fourteen days old or so. At about 14 days of age, the nestbox should come out of the cage. By then the kits are hopping out on their own, and leaving the nest box in the cage for too much longer can contribute to health threats such as infections and conjunctivitis. Between 2 weeks of age and weaning - between 5 to 8 weeks - the kits sleep a lot, eat a lot, and grow like crazy. This is the fun stage - watching the kits become more active! They're oh so cute. The kits in this picture are about 4 weeks old, and are positively thriving. One kit has dropped a food pellet on top of the doe's head. Ensure a constant supply of food and water. Remove the nest box by Day 18, if the kits haven’t yet jumped out. No one raising baby rabbits wants them to go blind due to a severe nest-box-contracted eye infection. Monitor the kits’ health. Check their behinds, for example, to see that they are clean and free of diarrhea. Some kits during this age might go through a loose bowel stage. Their sensitive gastrointestinal tracts have to obtain and maintain a healthy balance of bacteria during this age. Keep plenty of timothy hay or orchard grass in front of the kits, which helps to short-circuit gut problems. In general: We try to maintain a high level of cleanliness without obsessing over sterility. In general: If you don't need to, it is better to not push a doe to crank out babies, although the doe might disagree with you - she has an internal drive to multiply. Ensure that your commercial does receive enough food and nutrition to meet the demands of closely spaced litters. Feeding the doe one tablespoon of BOSS or whole oats on alternating days will result in a noticeable increase in milk production and enhance the doe's nutritional status. Kits grow at different rates, even in the same litter. Having 24/7 access to hay and pellets means that the little runt that was pushed away from the teat in the nestbox now has a chance to catch up with the rest of the litter. By 6 weeks old or a little older, you might not be able to tell him apart by size alone. Raising baby rabbits is the most fun at this age. Little 3-week-old kits are incredibly cute. Little fuzzballs, they zip around the cage, and then curl up with their littermates and knock out again for yet another nap in the hay. Dinnertime in the evening. These nursing kits are 4 weeks old. The 'meal' lasted 5 minutes, and the doe let me take her picture. 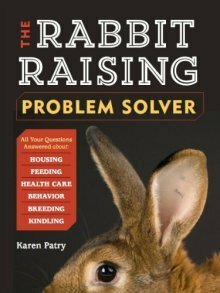 But raising baby rabbits finally gets old for the doe, and she decides she’s done with the pesky kits. If she were on her own in the wild, she would already be bred one or two days after the birth of the litter. She would HAVE to abandon the kits at 3.5 or 4 weeks of age in order to go dig a fresh burrow, in order to kindle her next litter just a few days after weaning. More than once I've reached into a doe's cage and patted her after discovering her new litter. The doe immediately lifted her rump. This behavior signifies readiness to breed again, even though the litter is just hours old. This basic drive to breed and rebreed in succession still resides in her genetic makeup, though since we don't breed our does on day 1 after kindling, the primal drive may not push her to wean her kits as hard as if she had been bred. When the doe weans her kits, she doesn't permit them to nurse. She will continually move away from their searching faces. If she gets exasperated, she'll push them aside, or even nip them or chase them away from her. The only absolute prerequisite for weaning is: the kits need to be able to reliably and completely feed themselves. The kits can feed themselves reliably by 4 weeks of age. But, weaning can be stressful to the kits. And if done without sufficient consideration, the stress can result in a potentially fatal enterotoxemia. This is why breeders do not typically wean as early as 4 weeks of age. An extra 1 to 2 weeks does wonders for their ability to withstand the stress of weaning without getting sick. On the other hand, it is also a temptation to leave the bunnies too long with the doe. Allowing more than 8 weeks before weaning is not necessary. So, when is it weaning time for baby rabbits? If you see the doe nipping at the kits, it's time. She can draw blood. When the doe is done raising baby rabbits, it's time to wean the buns. If you see the doe trying to back up to her little buckling sons as if begging for a breeding, it's time! She's obviously feeling a new set of hormones. We have seen this a few times, mainly in springtime during peak breeding season. Wean between 5 to 8 weeks of age (at the latest). In our barn, we wean our bunnies between 5 1/2 weeks and 6 1/2 to 7 weeks. We feel any longer than about 7 weeks does not serve either the doe or the kits, as the doe will forcibly wean her litter by approximately 7 weeks anyway. 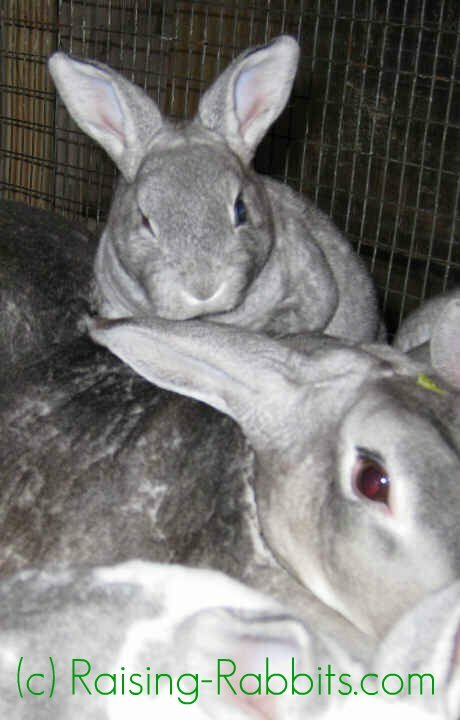 Other reputable rabbit breeders may have various weaning schedules that suit their particular rabbits. 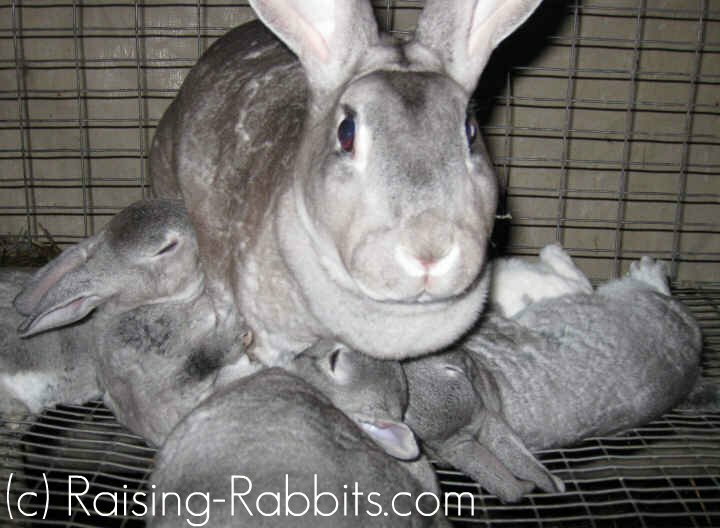 See Weaning Rabbits for more info on the weaning process and how to minimize weaning stress. Below: Just before snapping this photo, we permanently removed the dam from the cage, thereby physically weaning these nearly 7 week old bunnies. 7-9 weeks is an excellent age to put a permanent identifying tattoo into the kits’ left ears. In the United States, it is always the left ear. The right ear is reserved for registration. Other nations may have other practices and guidelines. 8-12 weeks of age is market age for fryer rabbits. By 9-10 weeks old, your bunnies should be separated into their own cages so they can grow out a bit. The more they grow, the better you’ll be able to recognize the animals you wish to assign to your own breeding program. Promising youngsters that may win on the show table. Junior animals having the particular traits and/or body type which will contribute to the goals of your rabbitry and needs of your family.